Assorted experts have weighed in to discuss the effects of the poor lighting in the photo and the peculiarities of color vision. "It is yellow and gold in this lighting," an ophthalmologist tells Mashable, explaining that "scientifically it has to do with the lighting and reflectivity of the material." A neuroscientist also in the white and gold camp tells Wired, "Our visual system is supposed to throw away information about the illuminant and extract information about the actual reflectance. But I've studied individual differences in color vision for 30 years, and this is one of the biggest individual differences I've ever seen." Scottish musician Caitlin McNeill, 21, started it all by posting the image on Tumblr. She explains the back story to Business Insider: "Two of my close friends were actually getting married and the mother of the bride took a photo of the dress to send to her daughter. When my friend showed the dress to her fiancee, they disagreed on the color." And in an example of how odd the Internet can be, the Tumblr McNeill posted it to is a fan page she has on talent manager Sarah Weichel, who BI says represents a number of YouTubers. Says Weichel, "The crazy thing is, I actually have nothing to do with the post. It's literally just a fan account of me, so my name and my photos are all over the account." Captain Kirks gold shirr on Star Trek from the 1960s was actually green. That was due to the TV cameras not being able to capture that color correctly not human perception but it shows how even un-altered images can be off. Shows how propaganda works, point of view and information provided for the point of view wanted. People are uneducated: dress has angular dependance on its reflectance. Look head on at 0 degrees, it's white and gold. 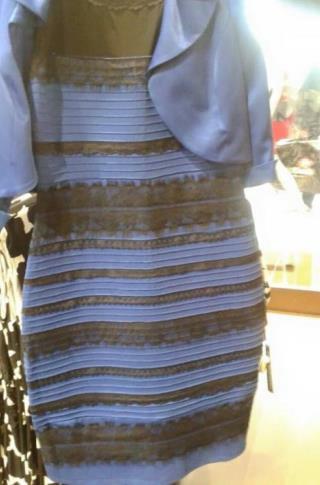 Look at it at a 45 degree angle, it's blue and black. Simple optical surface properties.